Air pollution is a severe and persistent problem at the foothills of the Himalaya Mountains in Pakistan, India, and Bangladesh. The haze and pollution back up against the mountains and remain for weeks at a time, posing a severe health hazard. In addition, scientists are beginning to gather evidence that the widespread and persistent nature of the pollution is even modifying the regional weather, particularly rainfall patterns. The pollution comes from inefficient wood and dung-fueled heating and cooking devices, as well as forest fires and industrial and urban pollution. These images were acquired by the Moderate Resolution Imaging Spectroradiometer (MODIS) on the Aqua and Terra satellites. The majority of the images in this series show Bangladesh wrapped on east and west by India. The Ganges River, flowing in from the west, and the Brahmaputra, flowing in from the east, join in Bangladesh and flow together out to the Bay of Bengal. In a few of the images, clear skies are visible over the Tibetan Plateau to the north. 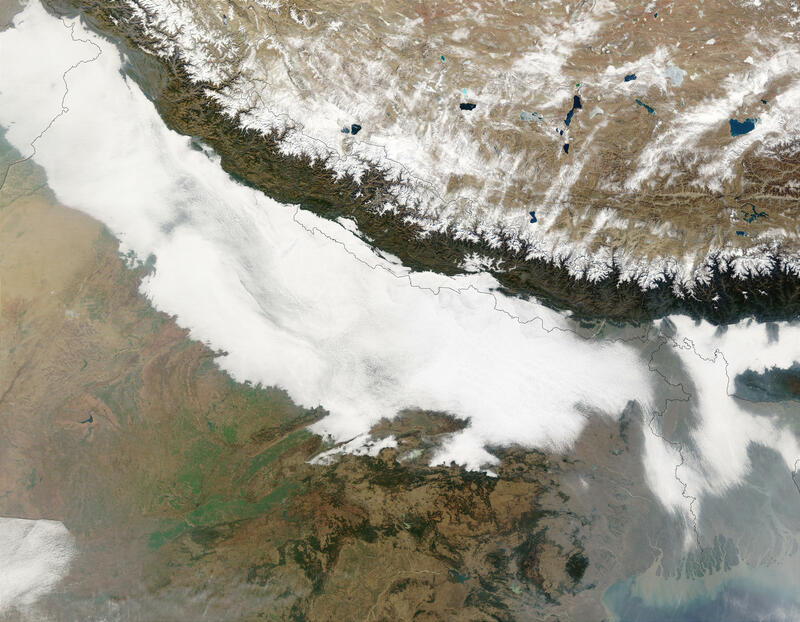 In the images centered farter west, such as the one from January 7, 2003, the Indus River runs north-south along the left edge, and Pakistan is visible west of India.